In a plot that couldn’t have been scripted better in a Saturday-morning cartoon, an Alabama man failed to rob a store last week when a cashier didn’t take him seriously. Hours later, he tried to steal a Honda Civic and failed, again, because he couldn’t figure out its manual transmission. 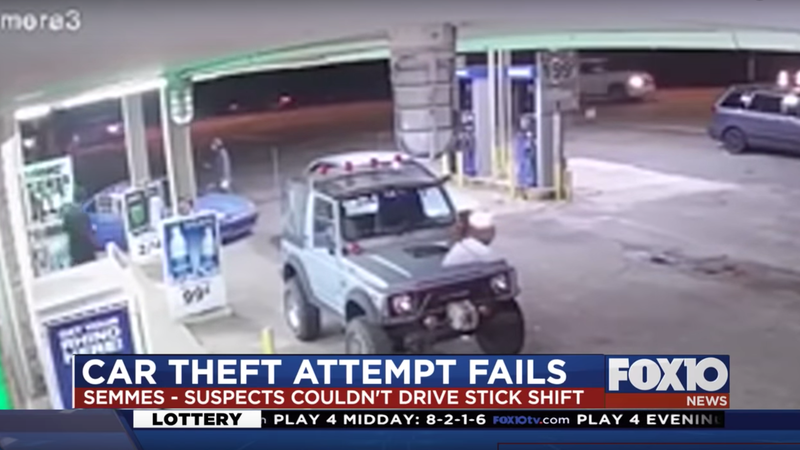 Mobile, Alabama news station Fox 10 reports that surveillance footage at a local gas station shows four suspects trying to steal the 1995 Civic, which was parked outside of the station with the keys inside. But it wasn’t as quick of a getaway as the suspects probably expected, despite that. It wasn’t even a getaway at all, actually. Fox 10 reports that none of the suspects knew how to drive a stick, which the Civic was. The one who got into the driver’s seat, later identified as Blake Lawrence, took so long that the owner of the car had time to come out, try to remove him from the car, and then go back inside to get his phone. That’s when the two suspects in the owner’s car gave up, and the two in the getaway car drove off. He ended up buying a six pack of beer before leaving the store, Fox 10 wrote. If this story were a Saturday-morning cartoon, that would be the point when he hunched over and sulked away, only to be pancaked by a piano upon walking out the door.